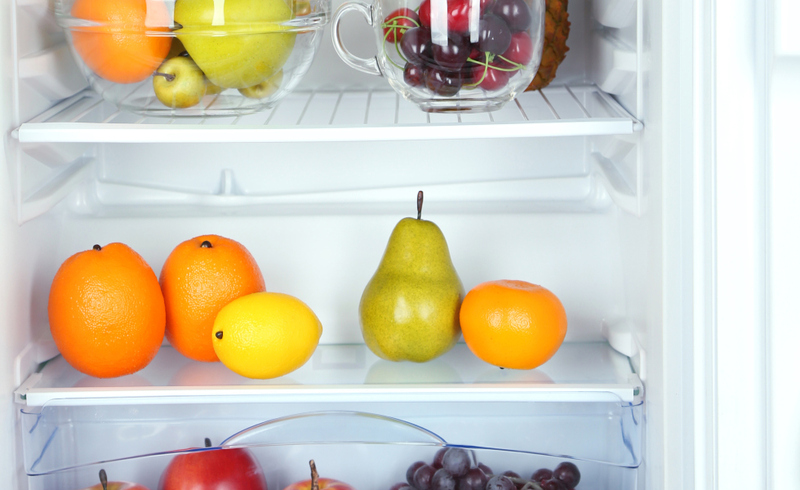 Vegetables and fruits in open refrigerator. Weight loss diet concept. Every heard the saying “one bad apple can spoil the bunch?” Well, that’s the truth. As you will soon learn, many fruits continue to ripen, age or could go mouldy once they are in your kitchen. This is natural – fruits are living, breathing organisms and they need looking after. if you see an apple going rotten or growing mould – compost it immediately. If a banana looks like its starting to over ripen, put it in the fridge. Also, try keep produce whole for as long as possible. Do not remove stems or even wash until you are ready to eat. If you do want to store sliced fruit, keep in an air-tight container in the refrigerator, which limits moisture loss and exposure to bacteria. Most of all; store fruits and vegetables separately. Always keep an eye on your fruit. Fruits need the right environments and temperatures to last. Keep cold-sensitive fruits (such as apricots, avocados, bananas, kiwis, mangoes and melons) on the counter. For everything else, get familiar with your fridge, which has different temperature zones. Keep produce such as berries, citrus and melon in the front where it is warmer. Fruits such as apples, cherries and grapes can be stored anywhere because they are less susceptible to chill damage. Lastly, keep in mind that most fruit is going to have optimum flavour if eaten at room temperature. If you take something out of the fridge, put it on the counter for 20 to 30 minutes to let it warm up before you eat it. All fruit produces ethylene gas, which helps it to ripen faster. In turn, the gas will ripen other fruit and veg sitting beside it and could cause them to spoil! Major ethylene emitters such as avocados, bananas, peaches, nectarines, tomatoes, pears and plums are best kept on the counter and can be tossed in the fridge once ripe to lengthen shelf life. Store separately to keep them from ripening too quickly. Keep all refrigerated fruit away from leafy vegetables, which should live in the crisper drawer. Bananas are the biggest ethylene gas culprits. It’s best to store them away from other non-refrigerated items. Other fruit that can be quite sensitive to ethylene and/or airborne bacteria are – avocados, apples, mangoes and tomatoes. Tomatoes are a good link between fruits and vegetables. They are, technically speaking, a fruit. But more importantly, tomatoes are a staple for most of us all year round. But if you are putting tomatoes in the fridge to keep them fresher for longer – think again! One of the most common food storage mistakes is keeping tomatoes in the refrigerator which rises them of their flavour and transforms their texture in just a couple of days. Instead, put them in a bowl that you have lined with a paper towel with the stems at the top. Their most tender part is around the stem, it is the most likely part to bruise and rot. Store at room temperature and keep them away from heat sources and direct sunlight. And if you are still not consuming them as quickly as you hope, do move them around in the bowl to avoid bruising. Just like your veggies (see here), you should try to consume your fresh fruits within 5 – 7 days and store them in the preferred environment in your kitchen. This time, we have put the list below together to help guide and assist where you should think about storing your fruit in the future. Stick this to your fridge as a little reminder to help you correctly find the right home for all your fresh fruit when unpacking your custom box.